Our work with responsible enterprise in the high-end sector is our Authentic Luxury Programme. Our work with the public and voluntary sectors’ promotion and delivery of responsible enterprise and finance is comprised of two programmes, Enterprise Trends and Engaging Change. The luxury industry has the mandate and margin to lead us towards sustainable lifestyles. A wave of awareness is sweeping the industry, but effective responses require the right intention and information. We champion social and environmental excellence as the future of luxury, and help designers, executives, experts and entrepreneurs, to succeed with this approach. We do this through research and producing reports, books and articles on the social and environmental performance of the luxury sector, as well as speaking at high-level events. We also host the Authentic Luxury Network. 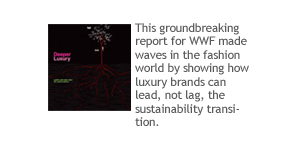 Our intellectual contribution to this field of practice includes the report Deeper Luxury, researched and written for WWF-UK. We understand that the luxury industry is different to other sectors, due to the nature of the customer, the importance of brand personality, and the need to excel. Luxury brands require specialist insight and advice on how to achieve social and environmental excellence in ways that be communicated positively to fashion and lifestyle media. We offer the full suite of our consulting services, to individual clients in the luxury sector, including strategy, creativity, communications, liaison, and education. Clients receive a degree of creativity, inspiration and connection to leaders in this field that is unparalleled. Our next intellectual contribution to this field of practice is a new book for luxury brand managers. 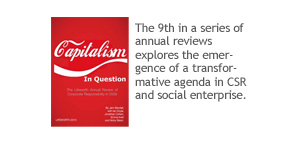 The role of business in society is changing rapidly, as the world becomes more interconnected while social and environmental challenges become more acute. 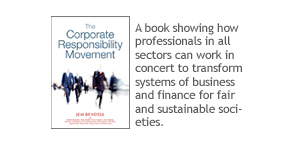 Understanding these trends in the context of business, as well as trends in responsible enterprise and finance, from international to local levels, is an essential prerequisite to understanding how to influence markets effectively, or offer services to help processes of change. We provide insight into responsible enterprise trends through our strategy, communications and education services. We have helped international non-governmental organisations, UN agencies and business schools better understand changes in the relevant business environment. We produce regular research reports and articles on these trends. 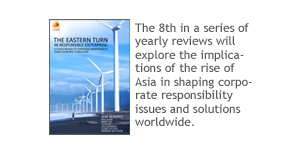 Our intellectual contribution to this field of practice includes our series of annual reviews, the 8th of which describes The Eastern Turn in Responsible Enterprise. Partnerships between organisations in different sectors have become more common in the past decade, and there is evidence of both success and failure. Leaders need to know when and how to partner with others, in order to achieve a scale of change that meets the scale of challenges faced, while delivering internal benefit. We are some of the most experienced cross-sector partnership practitioners, analysts and educators in the world. We help organisations with how to partner to create significant change, rather than because it seems a good thing to do. We bring an unusual level of rigour, from social sciences, for helping our clients understand when there is potential in partnership, or when to use other methods of exerting influence on a market. 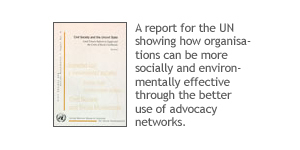 Our intellectual contribution to this field of practice includes the first UN report on business-NGO partnerships in 1999, as well as a new UN paper on how NGOs work in networks more effectively to influence economic governance issues, called Noble Networks? We work on these programmes with our services of strategy, creativity, communications, liaison and education.